On Monday night we were reminded of the bottomless pit that is Johnathan Thurston’s bag of footy tricks and why he is considered as having one of the most impressive football brains to have ever played the game. Thurston collected the ball from a charge down and began motioning to the referee for a six-again decision, creating doubt in the minds of Panthers defenders as to what was actually going on. As soon as he got the call from the referee, Thurston scooted through the confused Panthers defence, gaining 50 meters in territory. With the Panthers already back-peddling, the Cowboys scored off the play following the run. The superstar also hand in the other four tries the Cowboys posted against the Panthers. Very few players epitomise the quality over quantity ethos as well as Pat Richards. At 33-years-old, Richards could have easily been lacing up for his 200th game in the top grade. But after a stint in the English Super League, the Tigers winger turned out for remarkably what was only his 100th NRL game over the Eels. He marked the milestone with a freakish man of the match performance. Richards scored a try of his own and had a hand in two others, one which included setting up James Tedesco for a try of the year contender. After taking a cut-out pass from Tedesco, Richards boots the ball away as he being taken over the sideline by Parramatta’s John Folau. The kick heads towards the tryline, Tedesco leaps to take the ball and scores for the Tigers. 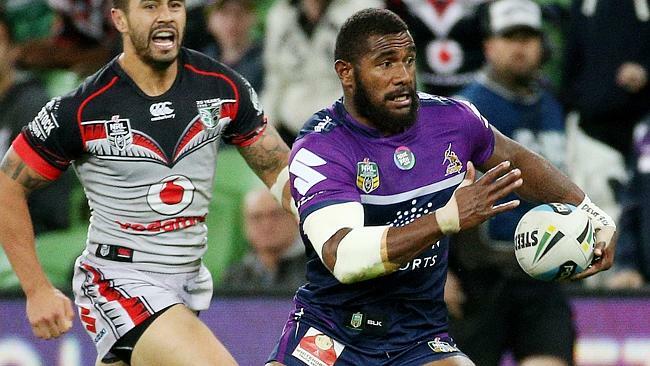 It’s hard to believe this Fijian flyer who was on the unwanted heap at the Wests Tigers is now the clutch player in a side that fields Cameron Smith, Billy Slater and Cooper Cronk. The Storm winger is fast building a reputation as a match winner and once again provided the crucial play against the Warriors on Monday night. With the Storm pinned in their own half and under pressure, Marika scooted past the Warriors defence from dummy half and went on an 80 metre run that layer the platform for a try to Glatsby. “That break he made was massive and I reckon he’s come up with a play like that every match this year, where we’ve needed something,” Storm Skipper Smith said. After an impressive debut against the Titans, young gun Jack Bird stepped up another notch to star for the Sharks as they once again stunned competition front runners, the Roosters. The 20-year-old who suffers from rheumatoid arthritis, set up one try and scored two of his own — one of which was the match winner in the dying minutes of the match. It would have made for tough viewing for Dragons fans — the junior Kangaroo was a product of St George Illawarra’s nursery only to be let go by the Red V to their local rivals. And with speedster Valentine Holmes getting better with each game at fullback and with Bird on fire at five-eighth, Ben Barba must be feeling uneasy about his future at the Sharkies. Roger Tuivasa-Schek’s move to fullback has helped him showcase his prodigious talent. The fleet-footed Kiwi international has been in scintillating form for the Roosters in the opening rounds of 2015. He ran for an incredible 316 metres against the Sharks in what was one of the most prolific individual running performances over the past 13 years. On Wednesday, the Roosters were left reeling with the news Tuivasa-Schek has inked a three-year deal with the Warriors from 2016.